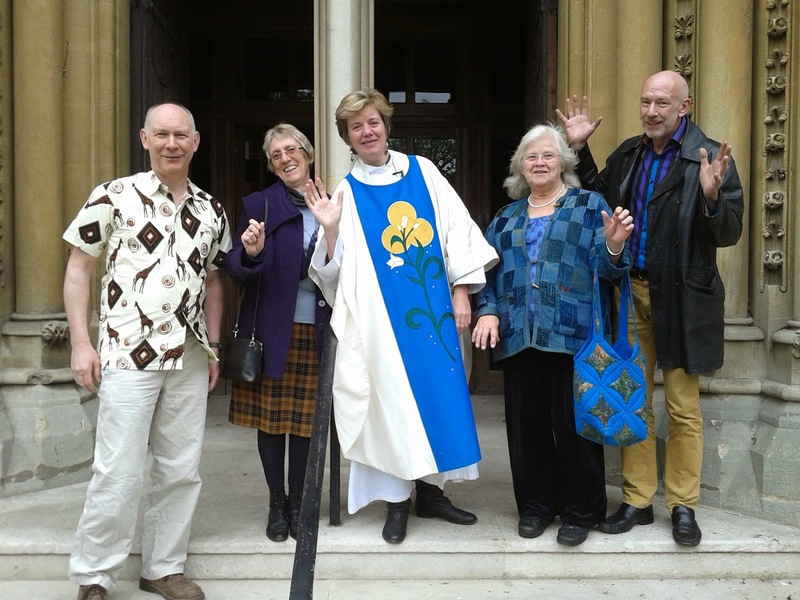 Our trip from St Mary's Stoke Newington in north London to the Church of the Epifania, Tete, Mozambique. We got home safely, although not completely without incident: at Johannesburg Airport, we had to collect our bags after arriving from Tete and check in again. Everything seemed to go smoothly and we all arrived at the gate in good time for our flight to London with our boarding passes, only to be told we were not checked on to the flight. How this is possible is anyone's guess - but we had to wait for 15 minutes whilst the staff tried to fit us in - and it was a very full flight. 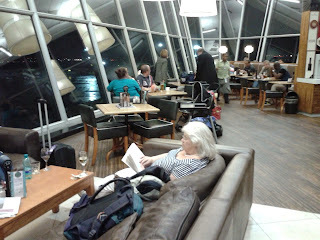 Eventually we were allocated seats but not the ones we thought we had - and Ann was upgraded to business class! But for the rest of us, it was a rather squashed 11 hours to Heathrow, but we got there on time. So here is a picture of us all on the steps of St Mary's this morning. 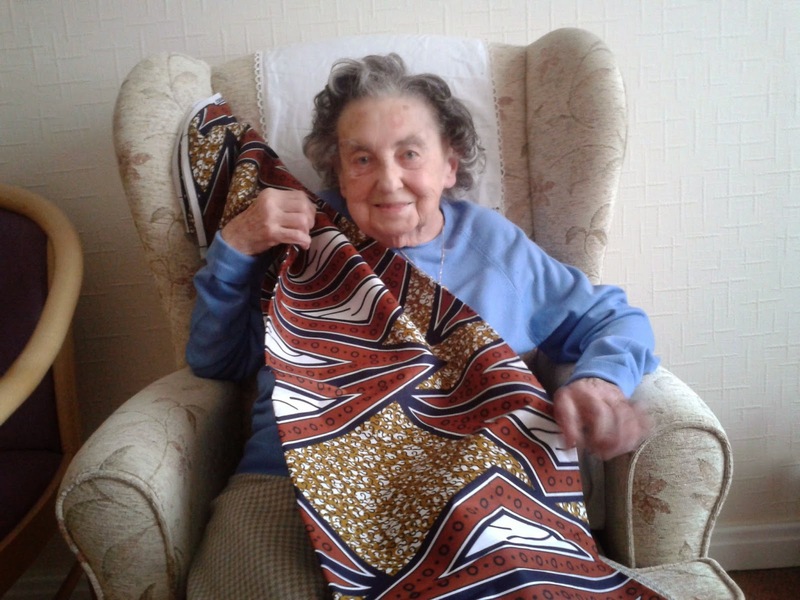 Our friends in Tete were so touched by Kathleen's blanket that we took out, that they sent her back a length of fabric - which seems to be a popular gift in Mozambique. She was very pleased with it: "It's very nice, although not quite my usual style". She is considering what to do with it. So here we are again in Johannesburg Airport. We thought we would have ages to wait here, but "the system is down", so we had to collect our bags, go out through passport control, and then check in and go through security again for our London flight - and with the public holiday weekend queues here, that took some time, so not much time left to browse the shops. Don't worry - we won't be late getting to the gate this time! We land at Heathrow at 6:30am tomorrow morning. On Thursday evening the mass at Epifania was lively and joyful, with many gifts exchanged. We were finally able to present the church with the chalice and pattern from St Mary's that (in all the excitement) had been mislaid on Sunday. It seems a traditional Mozambican gift is a length of the bright African cloth we have been admiring in town - it feels like we will be returning with most of the contents of the haberdashery shop. Many songs were sung and farewells said. After Mass we were invited to a relaxed supper by Esther and her husband. They had moved their sofa and armchairs into their yard so we could eat comfortably in the cool evening air (unseasonably cool, according to our hosts, but very pleasant for us). This morning (Friday) we were invited to a special breakfast at Colas and Katerina's flat overlooking the Zambezi bridge. Then off to the airport, where many of the Epifania community had gathered to see us off. We will meet again in London when they come to visit - no firm dates yet, but we hope it's in the next few years. On Wednesday we were invited to lunch with Alberto and Filomena, the founders of the Igreja Anglicana Epifania. After lunch they told us their story. They moved to Tete in 1991, and found there was no Anglican church there. They went to other churches but never felt completely at home. In the process they met other Anglicans who felt the same, and eventually they started to meet to pray together, under a tree in Alberto and Filomena&apos;s yard. They got in touch with the Bishop who encouraged them to continue to meet and to consider setting up a new congregation. Their first meeting as a church was on 6th January, Epiphany, and so the group named the church "Epifania". Eventually they acquired some land for the church. The Bishop advised them that they should first build a house for a priest, which they did - after this the Bishop sent Fr Rogerio to them. At that stage they met for worship in a tent attached to the side of the priest&apos;s house. Now the congregation has grown to the point where they could build their own church building, with support from St Mary&apos;s. However they are not stopping there, and have a vision for the future, aiming to establish other congregations in the area and even a school, amongst other projects. It was moving and inspiring to hear their story. "This blog is supposed to be about the Christian faith" said the Rector sternly (or at least as sternly as she could manage). But I do feel we have a responsibility to provide some insight into the cultural context. So here are some notes on Mozambican beer. There seem to be 3 types available: firstly, Castle Lite, a light lager-style beer. We recently visited a member of the congregation who clearly is fond of Castle Lite and had used a line of empty bottles as border for his flower bed - this sort of repurposing of waste is common here. Then there is Manica, a stronger golden beer that is very refreshing on a warm Mozambican evening (your correspondent can confirm). 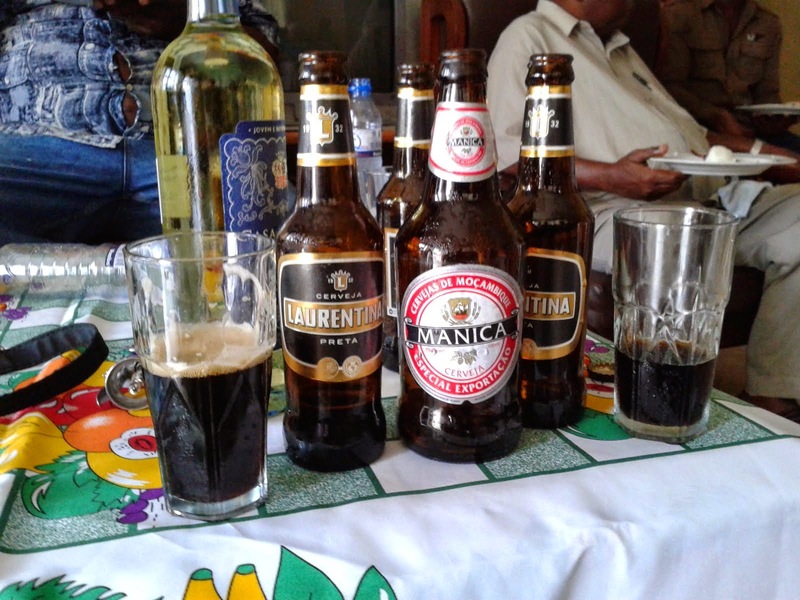 Lastly, at lunch with Alberto and Filomena yesterday, we were a little surprised to come across Laurentina, a dark beer not unlike Guinness - maybe a little sweeter - and also very pleasant. Our hosts seem to have alcohol only on special occasions - but as everyone has regarded inviting us to lunch or dinner as a special occasion, there has often been wine or beer on the table. We came to Tete to strengthen our link with Igreja Anglicana Epifania and especially for the consecration of the church St Mary&apos;s has helped to build. We knew the congregation would be preparing for their special day and we were wondering whether they would also manage to organise us an interesting itinerary too. 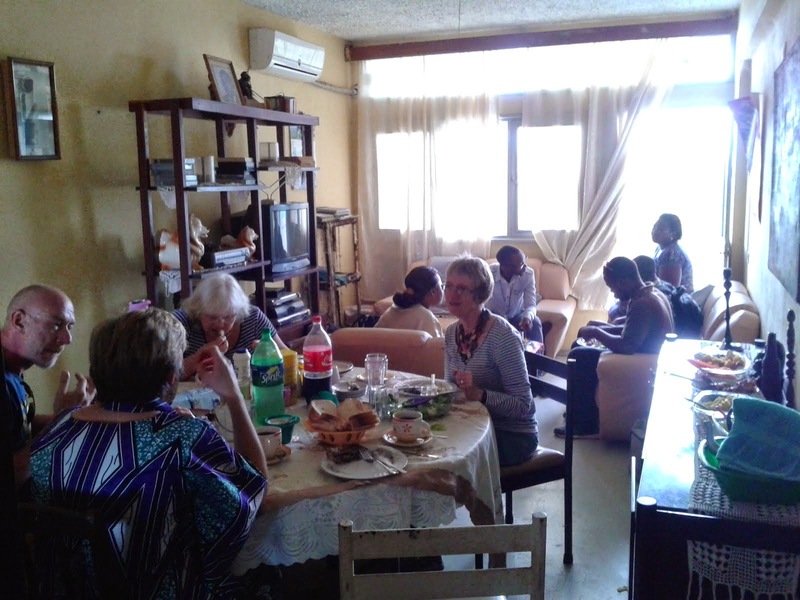 They have excelled themselves, providing us with a detailed programme of visits to enable us to see varied aspects of Mozambican life, hosting us for delicious meals as well as organising a wonderful church service. On Wednesday, 2 days after we arrived, we were taken to visit an orphanage, Aldeia de Criancas Tete, on the outskirts of town, funded by SOS International and other donors. It had the most beautiful grounds we have seen with two enormous Baobab trees, where 105 children & young people from babies to the age of 23 lived. The home also runs an outreach programme providing schooling for children in the local neighbourhood. Materials in the nursery were very sparse; but the children&apos;s smiles said it all. Michael was in his element! 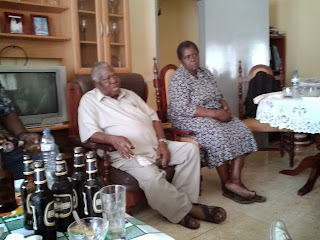 That afternoon we also visited an elderly people&apos;s home that seemed really impoverished. My mother is in a care home in England and I was shocked by the conditions these residents were living in. The manager told us they were under-funded and short staffed. They had no one to water their vegetable patch which looked in a sad state and no concrete surface between buildings within the compound, so the elderly residents had to negotiate rough stony ground. The grounds did include a traditional bread oven. Despite the lack of facilities their spirit was still strong. They seemed quite oblivious to the very loud music blasting out from the neighbouring pub.